Introduction: I happened onto this entry, originally published Jan 11, 2007 at 1HeckOfAGuy.com, a predecessor of Cohencentric, and thought it worth posting here. About a month before Julie died, I acquired the knack of making seared tuna. It’s not difficult: just brush a small, thick piece of tuna with sesame oil, soy sauce, pepper, and lime zest, drag it through a pan of sesame seeds until it’s coated on both sides, and quickly sear it in olive oil in a very hot iron skillet. I learned this recipe because. for a time, Julie would eat seared tuna even when she could tolerate no other food, even when I had to feed it to her. 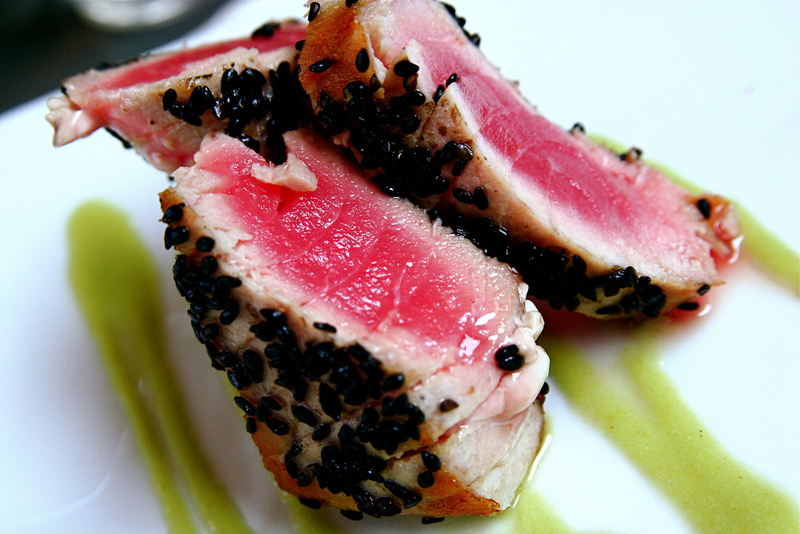 Seared tuna was another of the dishes I learned to cook because – well, Julie was, on many occasions over the years we were married, sick to the point of incapacitation, and, ultimately, she was dying. Discovering food she could enjoy was a blessing to both of us. Finally, of course, she turned away the tuna as well. It was, after all, only seared tuna, hardly a match for cancer or the ordeals of treatment. Shortly after Julie died, I taught our sons how to make scrambled eggs, ham and cheese omelets, and pasta with marinara sauce. I realized only this morning that, other than following the instructions on a box of frozen food or the back of a soup can, I have not cooked anything since. (in your excerpt of his acceptance speech for the Asturias Award).